We utilize Google Picasa™ to host some of the most current photo galleries, including on-going projects. This technology allows us to update our photo galleries quickly from remote locations, without changing the basic website design. Customers and clients can quickly view sample photos, flow plans, and basic designs as high-quality photos without the inconvenience and security issues of email. Photo galleries may be hosted as PRIVATE galleries, which requires an authentication code to view. Click on one of the thumbnails below to view the photo galleries. 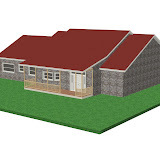 With different renderings of outside and roof materials. Very simple floor plan with the addition of the custom features such as the bay window and the vaulted ceiling in the Master bedroom. 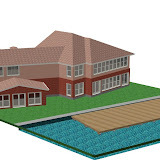 This remodel project involved enclosing an existing deck, adding full length windows for a view of the lake, a new game room, and a new floating dock. 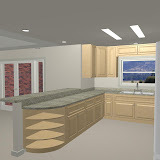 A complete kitchen remodel project, with new rendered view of the kitchen, living room and overall floor plans, including a proposed garage addition. This project was for a new vacation home near the city of La Fortuna in Costa Rica. The living room and both bedrooms featured glass wall for a view of the Arenal Volcano. 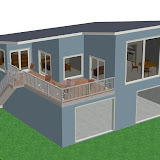 The home as designed as a single family, and a duplex.